GOING ON ADVENTURES: Has skydiving gone mainstream? 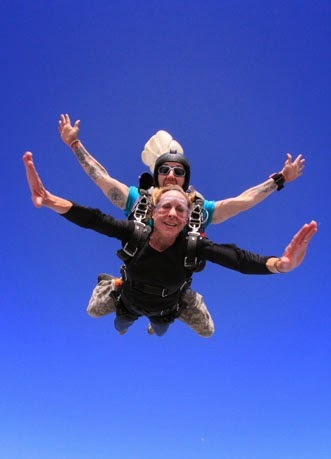 Who would have thought skydiving would become a trendy activity? Judging from multiple offers found on group discount buying websites like Living Social and Groupon, people are stepping out (literally) and taking the plunge. 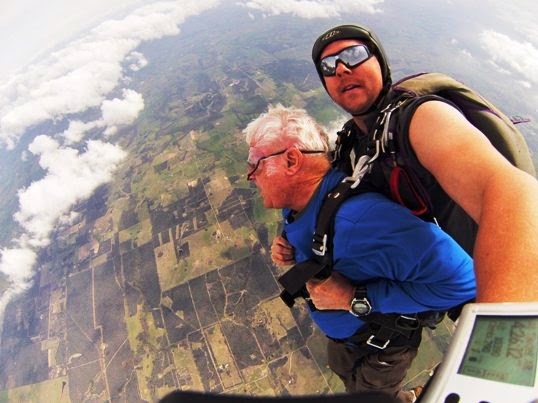 Has the public become more daring, or are we marking items off the bucket list? Or is the attraction of a large discount luring participants to this thrilling adventure? My first skydiving experience was awesome. When I first took advantage of such an offer about a year ago, I thought it was a novelty and a one-time splurge. I wasn’t alone in that thinking as it seems many people realize such offers make what could be a pricey endeavor more affordable. 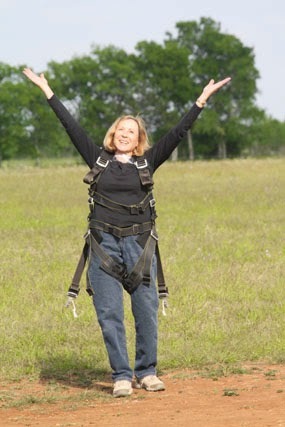 Within the past few months I’ve seen offers from Lone Star Parachute Center in Lulling, Texas (central to Austin, San Antonio, and Houston) and Texas Skydiving Center in Lexington, Texas. Larry surveys the ground below during the free fall. A quick check for the Dallas area revealed that more than 100 vouchers were bought on Groupon for a recent deal with Dallas Skydive Center. Prices are generally about half the rate stated on their websites. So, I bought vouchers from Living Social to jump again--along with my husband who wouldn’t go with me the first time but later wished he had. If discounts aren’t currently availble, but you’re interested, keep watching for these to appear again. It’s a thrilling experience that will make you friends envious. Free-falling is unlike anything else you can imagine—it goes by so quickly you’ll wish it lasted longer. You’ll feel incredibly brave, even if you did a tandem jump in which you leave the technical part to an expert. Drifting to earth after the free-fall is amazingly peaceful—with incredible views of the countryside. You’ll have a great excuse to celebrate with a toast. And you can relive the experience by showing videos or photos to anyone who will watch. Photos by Larry Burmeier and Texas Skydiving Center.